Insects can be very annoying when they enter your home. They spread many germs when they land on food, and some even bite you, which can cause painful sores and spread diseases to you. Children are the most susceptible to these bad health conditions because their immune systems are not as strong as those of adults. By taking measures to prevent the entry of insects into your house, not only will you be able to enjoy an environment free of bugs flying around, but you will also protect your family’s health. In order to prevent flying insects from entering your home, you must keep your doors and windows closed as much as possible or else install screens. 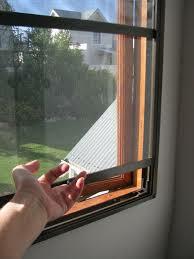 Screens are a great way to protect the inside of your home, while still allowing fresh air to flow. However, their effectiveness can be diminished when holes are present. It is very important to make sure that your screens are in good condition, so that they can serve their purpose. Remove the old screen from the frame. Pry out the old spine using a screwdriver. Discard the worn wire because the spline gets hard and brittle as it gets older and should not be reused or recycled. Measure the dimensions of the opening and cut a new screen. If the frame is made of wood, cut the wire on grain 3 inches wider and 6 inches longer than the opening. If the frame is made of metal, cut it 3 inches larger than the opening on each side. Attach the new screen to the frame. Use a screen rolling tool to push the new wire fabric into the groove. Fasten it around the frame. Trim the excess screen. Using a sharp knife or scissors, cut the excess wire and trim it close to the staples. Attach original moldings. Restore the damaged areas with paint.